How will you determine if your program is working? This section will provide you with the tools to monitor and evaluate your programs. compliance with funding body reporting requirements. Key terms used when talking about monitoring and evaluation are shown in Box 1.
outcome: results and impacts of the project (e.g. a percentage reduction in smoking, a change in behaviour). evaluation systematically assesses progress towards achieving outcomes. Table 1 provides examples of different outputs and outcomes for the TIS program. Monitoring outputs relies on describing and counting project activities and the number of people who come to events. In the past TIS reporting focused only on what is included in the outputs column – ‘what we do and who we reach.’ Now, however, you are being asked to think more about ‘what difference do our activities make?’ This is a question about your project outcomes. You can find out more about the ‘how, who and what’ of TIS project evaluation in Box 2. How to plan an evaluation? What are the reasons for evaluating your project? Who will read or listen to your evaluation? What sort of resources will you need for your evaluation? What are your evaluation questions? Who will do the evaluation? Work out who will be responsible for organising and writing up the evaluation. Who should participate in an evaluation? Good evaluations involve those who are interested and affected by your project. Involving people from the earliest stages of the project’s development to the final evaluation can encourage local communities to set up, control and own a project. Putting together a working group (a group appointed to study or report on a particular question) of community members also helps the evaluation process. A working group brings the values and shared interests of the community into the process. Often they are also the ones who are best placed to talk about the needs of their community. Be realistic about what resources are available to undertake the evaluation. This includes funding, time, staff, salaries, material, equipment and operating costs. Or for a more in-depth general discussion of behaviour change evaluation and definitions of some other terms used in monitoring and evaluation, you might find the Evaluation toolbox useful. 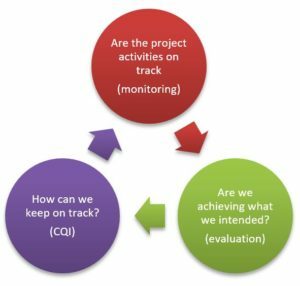 When should I think about monitoring and evaluation? Plan the project – what do you want to achieve, who do you want to involve, what will you do and how will you do it? Plan an evaluation – decide and consult about what you will measure, identify key questions, identify local sensitivities, identify good processes, and allocate necessary resources. Design the evaluation – decide on the methods you will use to collect the information you want, such as counting how many attend a smoke-free community event (output), giving out a short questionnaire asking what people thought of the event, and whether those who attended learnt anything about smoking harms, benefits of quitting, or quit support available (outcomes). Collect and record your information – do this systemically to get a true picture of what your project is achieving. Analyse your information – see if the program is achieving what you intended, or whether are are any unexpected outcomes, identify the lessons to learn. Decide if you need to make any changes to your project to keep on track. Provide feedback on your findings – let the people involved in the project such as the community, your organisation and the participants know about what was achieved. Examples of ways to present your data using charts and dashboards for good visual impacts can be found in this monitoring and evaluation resource or on the Resources to monitor and evaluate your program page here. developed by Menzies School of Health Research in association with One21Seventy. More tips for how to use monitoring and evaluation data are provided in Box 3. What do the early results mean in terms of what you are trying to achieve? Should you be changing the way you are doing things? How do you continue the positive changes you are achieving? Are you doing things in the best possible way? Are you talking to the right people about the progress of your activities? Are you making progress, making a difference? This material is used with permission from the Commonwealth of Australia. Talkin’ up good air contains materials that were contributed by Quit Victoria (Anti-Cancer Council of Victoria), Apunipima Cape York Health Council, National Heart Foundation of Australia (NSW Division), Council of Social Services of New South Wales and Queensland Health and which remain their property.